#8 has failed root canal treatment with chronic infection and sinus tract. We decided to extract #8 and place implant immediately after extraction. A temporary crown was cemented in place. Shown here are before, immediate and 3 weeks post-op results. 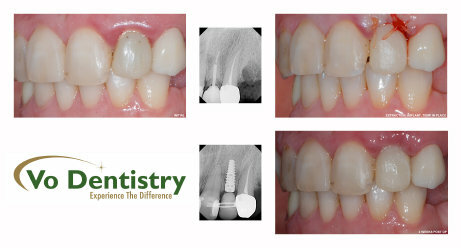 #10 had root canal treatment with loose crown due to root decay. 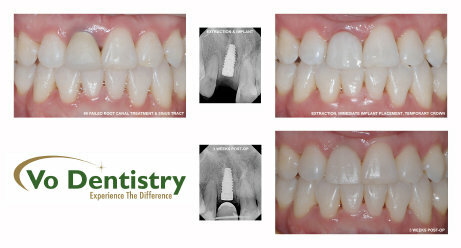 it is extracted and implant is immediately inserted into the extraction site. A temporary crown was cemented in place. Shown here are before, immediate and 2 weeks post-op results. #7 has root canal treatment and broke down to the gum level. We decided to extract #7 and place implant immediately after extraction. A temporary crown was cemented in place.